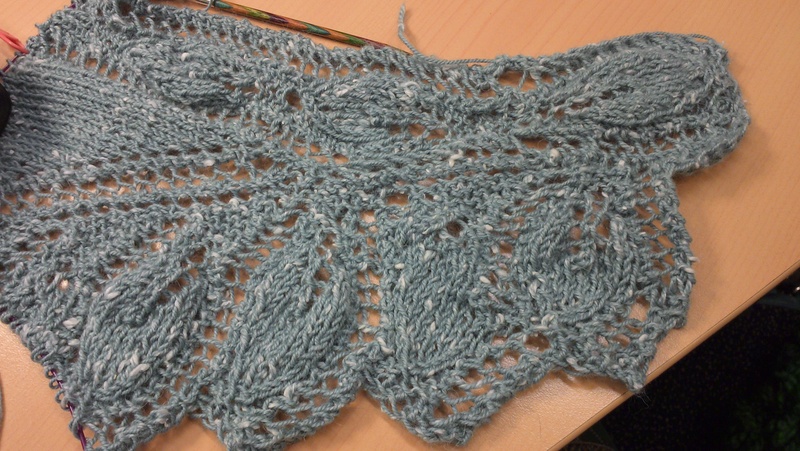 Leaf pattern Lace wrap – Done! Summer Holidays are most definitely over. The boys are back at school, the days are drawing in, the air is crisp and fresh and the trees are wearing amber leaves. I’ve been meaning to get back to writing for a while but life got in the way in the shape of a bad bout of cold. I remember sitting at that desk! I cast on in the autumn and having never done any form of lace knitting, it was slow going indeed. I remember that it would take me 30-40 minutes to knit two rows. However, train journeys helped me to persevere. Then I lost interest and many other knits followed. 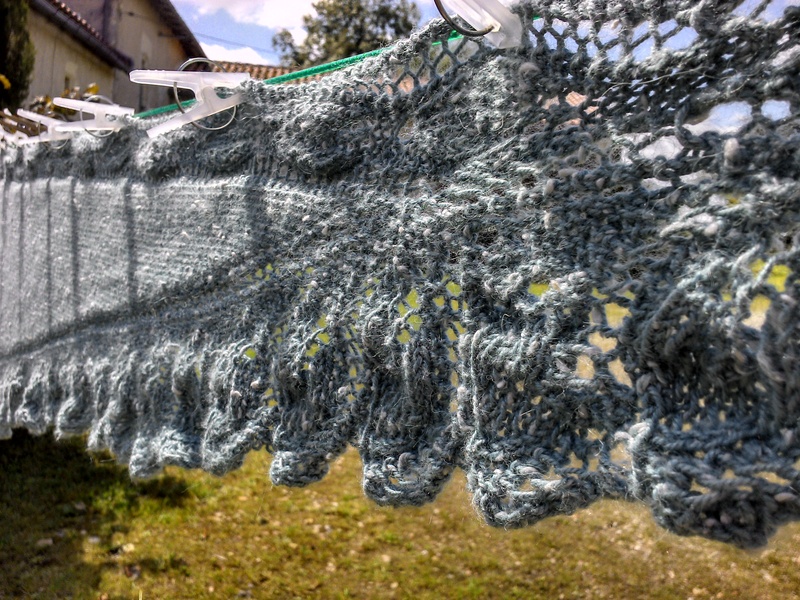 Each time I would look in my WIP basked, there would be that lovely speckled silk yarn and the half done wrap. I felt guilty. I think that finishing long slumbering work is a frame of mind. Sometimes it just happens. 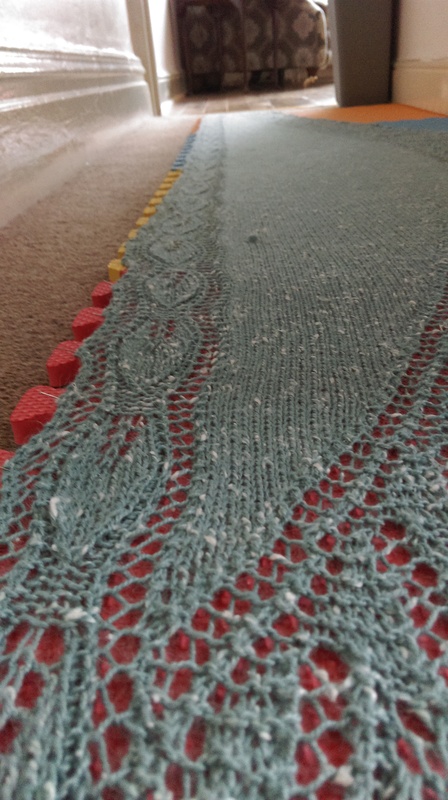 From the beginning of the summer, although I had many ideas for knitting projects, nothing would feel right until I picked up my WIP basked. At first it was only to check for moths (grrr) but then as the yarn tumbled out, I fell in love all over again. And surprisingly quickly, the wrap was finished. Here it is with a summer backdrop. That lovely blue sky sets this off nicely! I’ve got to admit that I was a little disappointed with the depth of the wrap – I always think of wraps as wide and long so it covers everything. Semele is not like that at all. It is a dainty slip of a thing for the shoulders and mid-back. I’ve got to say that this summer it saved me many nights of feeling cold and the chic French women all complemented me on it too. It was perfect! 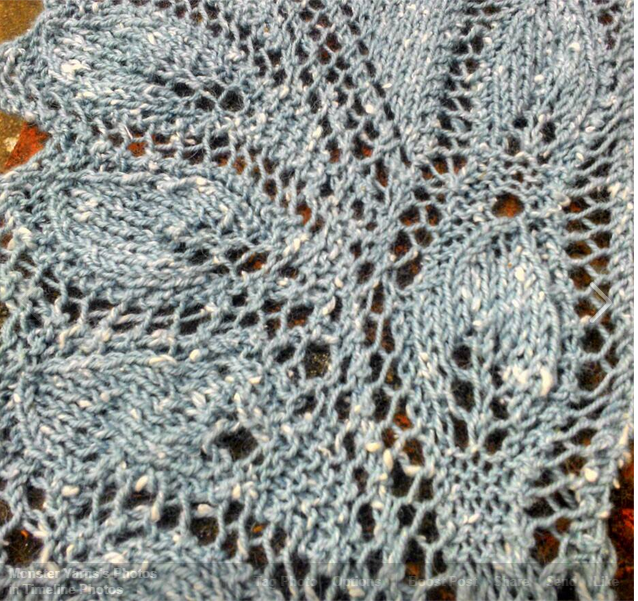 When we came home however, I knew that the lace had to be blocked and since I’m not well versed in lace blocking I was really dreading it. So far, so good. The pattern has opened up, the leaves are distinct, the wrap is wider and longer, my mistakes have been unearthed for all to see and the yarn is looking nice. It’s not quite dry yet so I will leave it pinned for a while longer. I hope you have all had a very relaxing summer. I have a number of pattens to share with you during the autumn so come and visit soon. 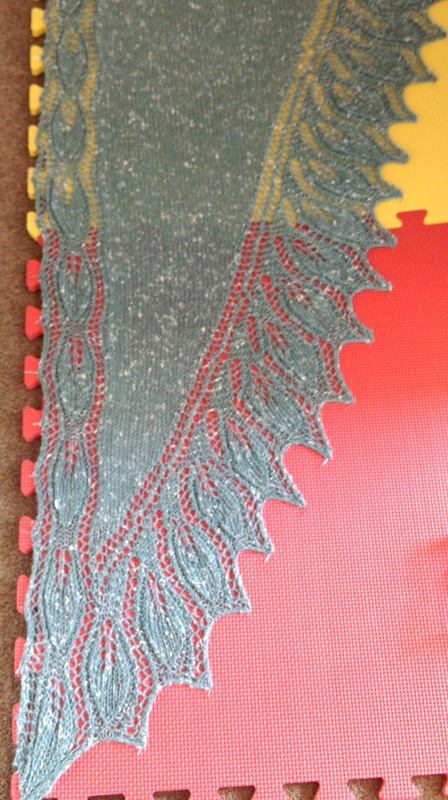 This entry was posted in Lace, silk and tagged lace knitting, silk. Bookmark the permalink. 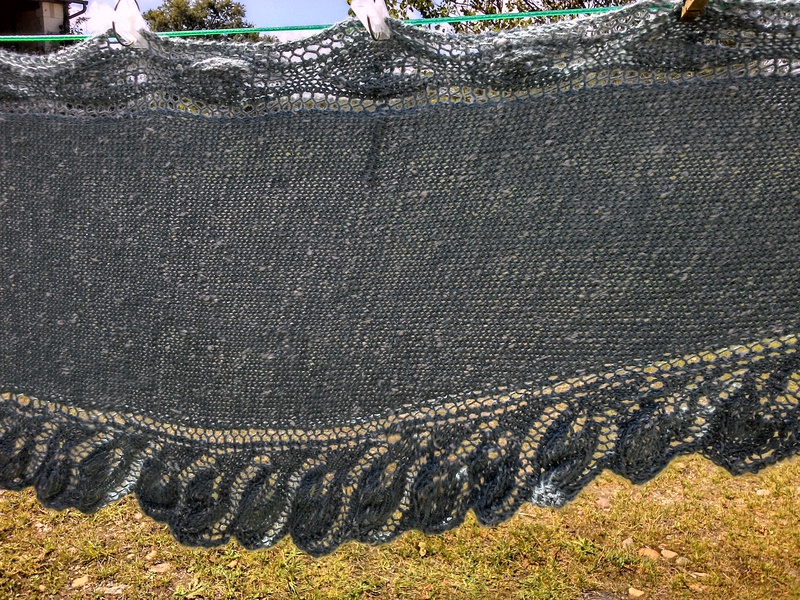 14 Responses to Leaf pattern Lace wrap – Done! It looks fantastic. One question, what actually is blocking and how is it done? I see it involves water and requires some space. Well, for me blocking involves a lot of angst and bad language! For most normal knitters, it is a quick rinse through of your project and pinning it in the shape it should be and leaving it to dry. 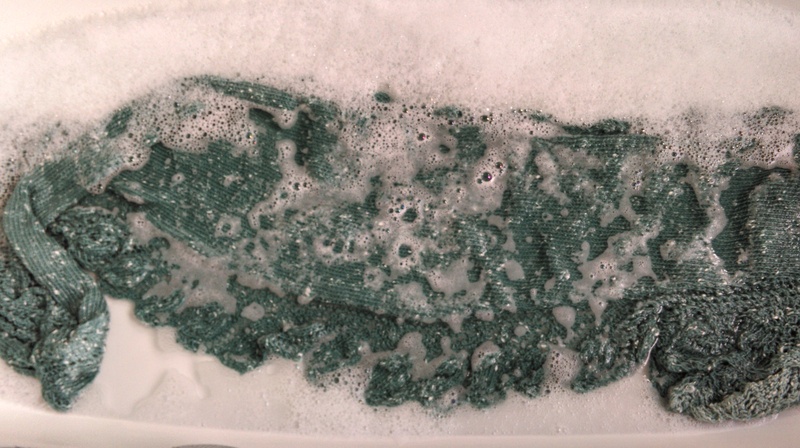 I’ve done a blog post about washing knitting and reblogged one on blocking – have a quick look if you have the time. 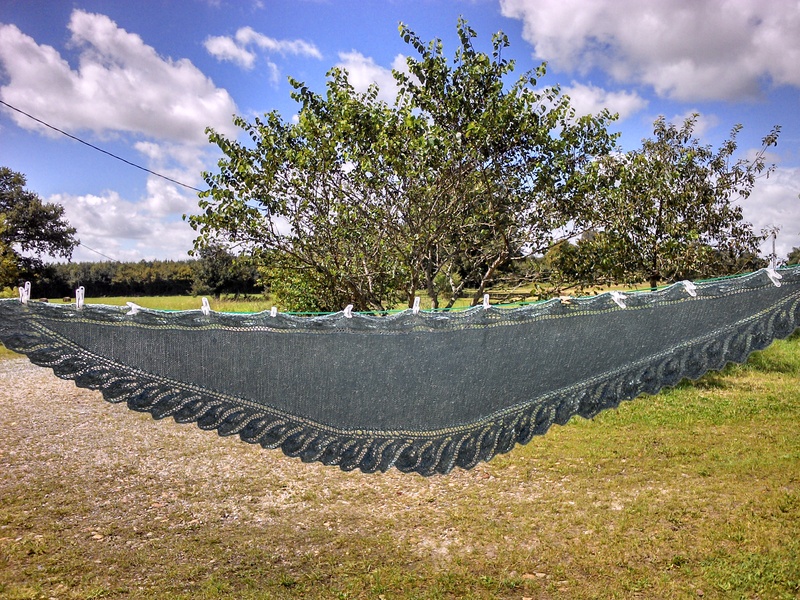 I’m saving up for blocking wires! Beautiful. I especially love hearing about the progress of this project. I think we all must have one of these in our crochet or knitting history. For me, it was a crocheted short-row beanie. Never quite got it right. Two years later, it’s still a WIP. It’s so odd as now it’s finished, I’m wondering what on earth kept me from getting on with it. And what on earth prompted me to start in the first place 🙂 I’m much more into all over lace patterns now (more to come later…).